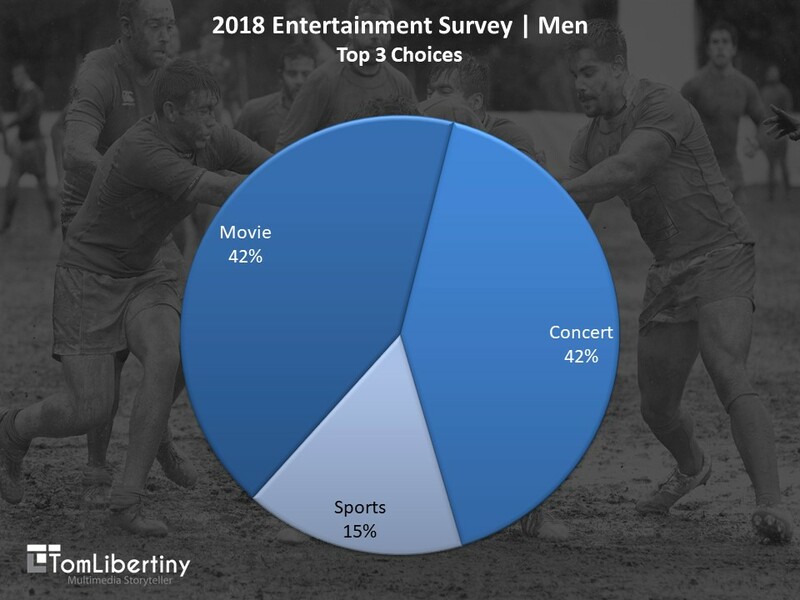 Results and observations from my 2018 entertainment survey about men and their entertainment choices. 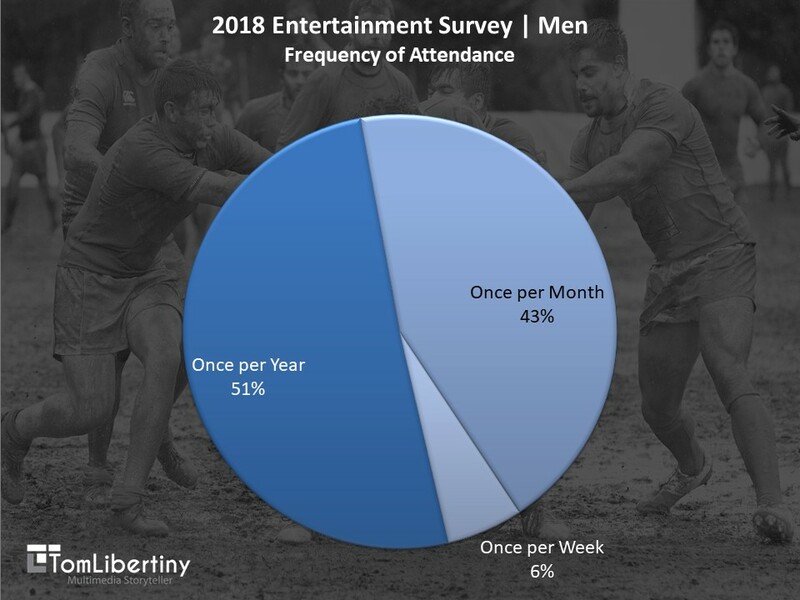 This year, men started showing signs of attending events on a weekly basis (Reference | Chart 3) which is a complete change from the results of in 2016. On the other hand, from 2016 to today, women have moved away from attending weekly events and instead attend events on a monthly or annual basis. Pricing, while a major consideration, continued to be less of an issue for men than for women. But, women and men are now at parity on ticket pricing; frequently stating that they’d pay in excess of $50 per ticket and some as high as $150 per ticket. Regarding pricing, the exception was ticket pricing for movies. While both women and men agreed that movie pricing should be lower than other events they attend outside of their homes, men’s new normal for a movie was $20 to $30 while women’s moved up to $10 to $20 per ticket. 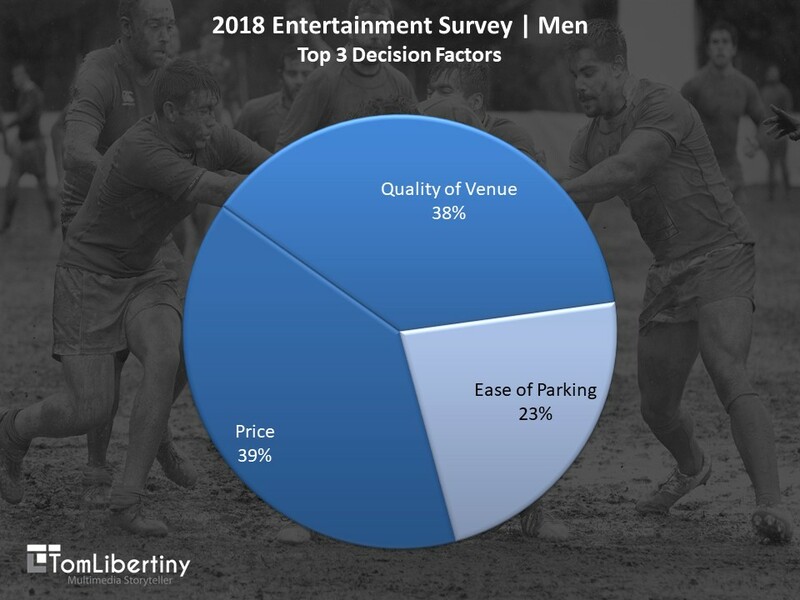 Another significant change for men from the 2016 survey: content (a Unique Story) has fallen out of the Top 3 Decision Factors (Reference | Chart 2) and was replaced by Ease of Parking. While content remained important it’s not the deciding factor it once was. Some of the change can be attributed to men’s third entertainment choice being Sports, instead of women’s preference for Plays, where the content was a known entity. But, venues need to be aware that nearly 2/3rds of the decision to attend or not attend an event is now completely under your control: Quality of the Venue and Ease of Parking. If you’re a venue owner or manager that caters to men, do you measure up in the areas that are now important to men? There’s been a significant shift in what men want in entertainment. Now’s the time to adjust your strategy.